Don't get excited by this title...I'm definitely not getting married!!! However, two of my closes friends and my brother are! Weddings are soooo much fun especially when you're in them. But in the midst of my elation with all the love that's in the air, I can't help but think about my biggest fear! Barney!!! Yes, that friendly dinosaur scares the crap out of me. I love purple...it's my favorite color...but Barney looks huge an uncomfortable in purple. So in between now and November (wedding #1) I'm on serious grind mode. I can't be the Barney of the Ball!!! So, what's my plan might you ask? ***DING DING DING*** Yes, I bought a treadmill. I'm so excited about the newest addition to my bite-size apartment. 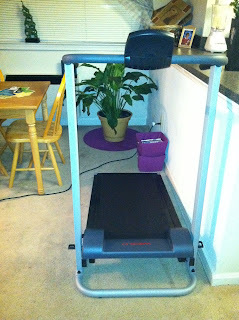 With a brand new treadmill staring me in my face I can't help but feel guilty enough to get off the couch. I can still watch all my reality shows, movies and more while climbing mountains in my cozy apartment. Barney is my BIGGEST fear but Laziness is my BIGGEST enemy...the two equal destruction. LET'S GO TO WAR!!!!!!! !